Life is too short to just love cycling! So I have chosen to love coffee too. A recent visit to Look Mum No Hands on Old Street in London reaffirmed to me that the two are intrinsically linked. Whilst sitting in my favourite coffee shop, surrounded by some of my favourite things I stumbled across a little book sitting on the shelf. That book was called The Independent Coffee Book London, and in it were a selection of other independent coffee houses all over London, who like Look Mum No Hands held their independence and product in proud regard. 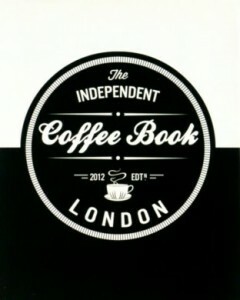 The Independent Coffee book is small enough to slip into your bag or musette and contains 36 entries spanning from the city to south of the river. For each café The Independent Coffee book details opening times, local trains and buses, whether alcohol is served as well as the important facts like the machine and grinder they use, as well as the house bean. The book is split into handy sections, grouping the cafes by area. I have now tried 4 of the cafés and all serve great coffee. I am looking forward to trying the rest. At £10 the Independent Coffee book pays for its self in the quality of the coffee you will enjoy, banishing the manufactured multinational coffee chains, to only be used when a child in your care declares “I need a pee! !” The book of this quality is naturally available through a number of online and traditional outlets (Both tax paying and non). If you want to support an independent coffee house and buy the book then look no further than Look Mum No Hands or try the publisher direct Vespertine Press Make sure you have a look around the Vespertine website, they have a fantastic looking coffee map for £2.50 which I would love to get my hands on! Copyright © 2019 A Little Bike Blog. All rights reserved.